Super Fly has stopped Crazy Cockroach from taking over the world. He's conquered an entire hypnotized city of bugs. He's even battled his own sidekick! But now Super Fly is facing the most dangerous threat of all: an evil army of insects organized by Crazy Cockroach himself. Suddenly he's up against tarantulas, black widows, hornets, killer bees, fire ants, leeches, and more -- all with one thing in common: they're out to destroy Super Fly, and the world he inhabits, for good. Perfect for fans of chapter book series like Captain Awesome, this boisterous story told through black & white illustrations proves superheroes come in all shapes and sizes. 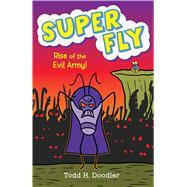 Todd H. Doodler is the author of the Super Fly series, including The World's Smallest Superhero!, Revenge of the Roach!, and Super Fly vs. Furious Flea!, as well as many other books for children including the popular Bear in Underwear series. He is also the founder of David & Goliath, a merchandise company that produces clothing, posters, and toys. He lives with his daughter and their two dogs in Los Angeles, CA.